Here's a rod that will allow you to fish small baits with light line and still be able to control a big fish, even in fairly heavy cover. It's made for fishing clear, open water when fishing pressure makes the bite really tough. Incredibly light, thanks to our NRX technology, it's the strongest, most sensitive, high-performance magnum-taper spinning rod we've ever made. Catching those finicky, pressured fish won't seem like such a challenge anymore. There are times when you need the power and action of a casting rod, but at times conditions dictate smaller, lighter baits where a spinning rod is preferred. 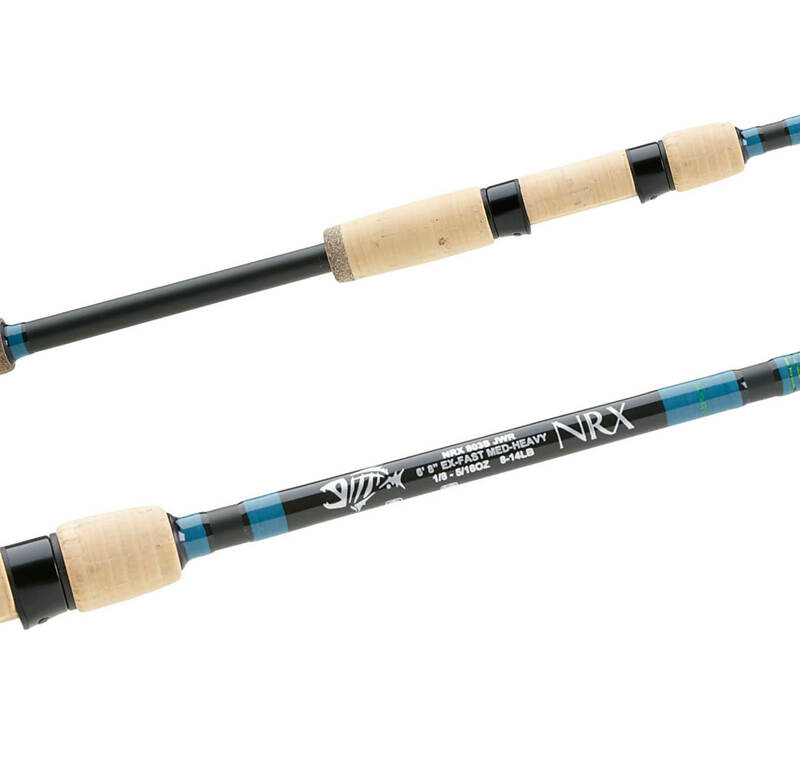 Whether it's lighter baits or lighter line or both, this NRX rod has all the right stuff. So light and sensitive, when you first pick it up you'll wonder how it will handle those big bass - but once you've hooked one you'll know what we mean. Designed to fish medium-sized soft plastics and light jigs, but it will also handle topwater baits or even spinnerbaits, no problem. There's no doubt about what's going on at the end anymore thanks to NRX. Sometimes it's just difficult, especially in the wind, to cast lightweight lures and smaller soft plastics. That used to be an issue, but no more thanks to NRX technology. First of all, you'll be amazed at how light this rod is and if you doubt the power, just rig it up and give it a try. Only then will you understand what high performance is all about. Add to that sensitivity beyond belief and you've now understand NRX. The extra-fast taper allows you to make low, accurate casts so you can fish right up under the brush - and when a real 'toad' grabs your bait, you'll be in total control. If you need a rod to cast soft plastic jerkbaits and Senko's, this is the one. When the fish go deep you need a longer rod to control the bait, recover line quickly and set the hook. Our proprietary NRX material allows us to use far less high-modulus graphite than we've ever used so we can make longer rods that fish a lot shorter! They are insanely light, move more line and fish the deep ledges better than any rod on the planet! Add to that sensitivity beyond belief and you've to an NRX. This is what high performance is all about. The extra-fast taper and extra length increases tip-speed for longer casts and more positive hooksets... especially important in deep water! A dynamic "big water" rod, it is especially good for fishing clear-water impoundments where you need to keep your distance to be successful! Dragging tubes is a technique used extensively on the Great Lakes! It's all about covering water and putting your bait in front of as many fish as possible. You need a rod that's long enough to give you extended range, sensitive enough to feel every nuance of what that tube is doing down there and powerful enough to set the hook and get the fish headed in the right direction. NRX is a true revelation in graphite technology. It allows us to make rods lighter that fish a whole lot "shorter" with extreme sensitivity and subtle actions to protect lighter line without sacrificing power. If you drag tubes you need this rod - end of story! Whether you're dragging tubes on the Great Lakes or fishing small jigs on any clear-water impoundment, long rods are the rule. They make it easier to control the bait and set the hook. NRX intensifies the experience! Rods made with this proprietary fiber are incredibly sensitive, insanely light and responsive beyond your wildest dreams. This is the epitome of high performance! The extra length makes it nice for fishing deep-water and thanks to the fast taper, you can cast a tube a country mile! Big water and wide open spaces demand a rod of this caliber... G.Loomis is happy to create it! This is refined technology at it's best!